Fans of Baroque opera will have to see this – they've never seen anything like it, probably. Stefano Landi's "dramma musicale" was presented, by papal commission, in Rome in 1632. It is a work that is typical of the Counter-Reformation in its artistic strategy of seducing the ears and the eyes in order to bind the audience more closely to the Catholic church. Ironically, the plot is one of self-denial. Alessio (Alexis) was the son of the Roman senator in the fifth century. Immediately after his wedding, he told his wife that he was leaving her to serve God – but not to worry! He stayed away for 17 years. Then he returned as a pilgrim and was taken in as a lowly servant in his family's house, unrecognized, under the noses of a wife and parents who still mourned for him. He passed away 17 years later, and only after his death was it revealed to his loved ones that he had been with them all that time. Alexis subsequently was recognized as a saint, although to our sensibilities, his behavior seems a little hard on his family! 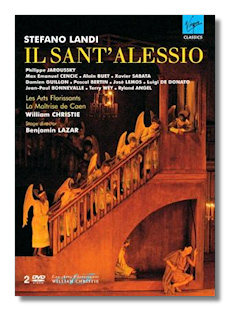 Landi was a contemporary of Monteverdi, and the musical language of Il Sant'Alessio will not be unfamiliar to those who know Monteverdi's operas. It might not reach Monteverdi's heights, but it comes close. The excellent libretto is by Giulio Rospigliosi, who three decades later became Pope Clement IX. To make the story more palatable for the stage, Rospigliosi added a demon (who is always trying to tempt Alexis into revealing himself) and comic servants. There are dances too, although be assured that they are of the highest moral rectitude! Because women were not allowed to appear on stage within the Papal States, castrati were used for all of the female roles, including Alexis's mother and his wife. In this otherwise authentic production (castrati being in short supply), the castrato roles are taken by countertenors or falsettists. A tremendous cast has been assembled for this production. Philippe Jaroussky has one of the most uncannily beautiful countertenor voices known to modern man, and it is joy to see him not just in recital, but in an actual operatic production. Although the opera is named for Alexis, many other roles are just as important, and so Jaroussky shares the spotlight – candelight, more accurately – with many other fine singers, who really deserve (and earn) as much credit as he does. There's even a small phalanx of young boys, including several with solo duties, and they far exceed one's expectations. I'm perplexed by Luigi De Donato, who sings the role of the Demon. The writing frequently seems much to low for him, and the result as a sort of musical growling, but I am wondering if this was done intentionally. Some opera fans complain about how far we've strayed from the "good old days" of Tebaldi, Callas, and Price. That might be true, but performance standards in Baroque opera are higher than ever, and a performance like this one would have been impossible thirty years ago. On the second DVD, there's a bonus in the form of an interview with Christie, Lazar, and Mouty. Although it is a little lengthy, it might be a good idea to view it before watching the opera proper, because it does provide the viewer with good background information. The booklet includes a good essay by Dominique Fernandez. Curiously, it omits a track listing. This is a must-see, unless you foolishly believe no worthwhile operas were written prior to Mozart.